he Guardian of Monday, 30 June 1997, proclaimed 'Ancient Kingdom Demands Return of Lindisfarne Gospels', while The Times of Thursday 3 July of the same year, gave the British Library view that the 'Lindisfarne Gospels Must Stay in London'. Archeologists from Leicester University working on Lindisfarne had meanwhile unearthed what the Press called a 'Dark Ages Gospel Factory' at the Green Shiel site and a Cambridge professor was asserting that the whole thing was a myth . . .
Whatever was happening in London and darkest Northumbria? Certainly nothing to do with Florence or Italy, surely. However, unknown to most Anglo-Florentines, or London journalists with a dearth of news, or Northumbrians belatedly set on resurrecting their historical identity, there actually is a survivor of Northumbria's Golden Age. A Pandect, known now as the Codex Amiatinus (click on underlined words), was produced in the twin monasteries of Jarrow and Monkwearmouth some time before 716 A.D., and is still extant, in the Biblioteca Medicea Laurenziana, the Laurentian Library, in Florence. In the seventh century after Christ, the Northumbrian abbot, Benedict Biscop, made several journeys to Rome and back. His visits were of prime importance to the learning, culture and religion of Northumbria, making him one of the most important figures of its Golden Age. Benedict Biscop was probably born around 628 A.D. and have have been baptised 'Biscop' in honour of the Bishop Paulinus. 'Baducing' was his usually forgotten surname and Benedict was a nickname given him because of his enthusiasm for the Order of St Benedict. As a young nobleman, he was called up for warrior-training, military service, in King Oswiu's hearth troop. When he was twenty-five years old and his service completed, instead of marrying and settling down, Biscop spent his pay on foreign travel, accompanied on part of his first journey by another young Northumbrian nobleman, and future saint, called Wilfrid. It was not until many years later, however, that Biscop made his final decision to become a monk. In 674 he was given seventy hides of land by Oswiu's son, Ecgfrith, who had succeeded Oswiu as King of Northumbria. The land was at Monkwearmouth, and it was there Biscop founded his first monastery, based on Continental models, and completely unlike the Celtic simplicity of Lindisfarne. He was later to found a twin monastery at Jarrow. Both were well-stocked with precious manuscripts, which Biscop acquired on his journeys to Italy. In 679-80 Biscop was accompanied to Rome by Ceolfrith, the Abbot of Jarrow, who purchased the Codex Grandior, a vast Pandect of the Bible, and who took it back to Northumbria. The Codex Grandior ('larger book') was a complete Bible in Latin. The Codex had been produced in a monastery in the south of Italy, at Vivarium, founded by the Roman Senator, Cassiodorus the Younger, on his retirement from political life. Cassiodorus had spent his political life in Ravenna (then under Ostrogoth rule), trying to save the Ostrogoths from the hostility of the Eastern Empire of Byzantium. In retirement, on his estate at Squillace, he had his monks at his monastery write out many books, including his own nine-volume Institutiones and the Codex Grandior, complete with illustrations. 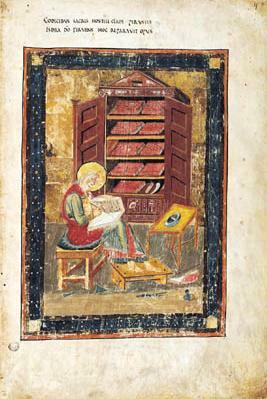 Indeed the most famous illustration in the Codex Amiatinus, its 'Ezra' page, may have been based on a portrait of Cassiodorus himself, at the beginning of his Codex Grandior, seated, writing into his book in his lap, with the nine volumes of his Institutiones on display behind him in a book cupboard. The Codex Grandior is no longer in existence, but it has left its descendants to us in the forms of the Codex Amiatinus and, most probably, the Lindisfarne Gospels, whose Matthew and Mark illuminations (the latter reversed) may also be based on the Cassiodorus portrait of the Codex Grandior. The Lindisfarne Gospels was produced by Eadfrith of Lindisfarne in honour of St Cuthbert at about the same time that Ceolfrith at Jarrow personally commissioned the Codex Amiatinus. At the same time, two sister-volumes of the Codex Amiatinus, somewhat less elaborate, were also produced. Unfortunately, all that remains of them are a few pages discovered in 1909 in a curiosity shop in Newcastle-upon-Tyne by a Rev. 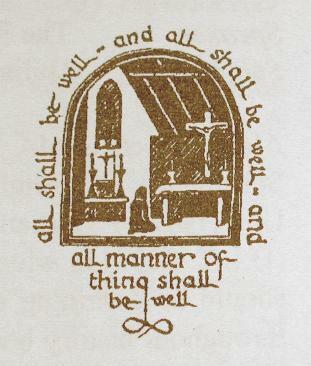 W. Greenwell, and eleven further leaves, used as covers for estate accounts, which came to light in the late 1930s, also in the North of England. These leaves were acquired for the British Nation by the Friends of the National Libraries. Ceolfrith, having made his monks work on the Codex Amiatinus, surprised them in much the same way by announcing that the completed Bible was to be a present for the Pope, in return for The Confessions of St Peter. Moreover, he intended to take the Pandect personally, to hand it over in Rome, and then remain there for however long was left to him of his life. He was then 74. It is now the oldest surviving complete text of the Latin Bible. Seven scribes have been identified among its writers and decorators. It runs up to 1030 folios, each double thick skins measuring 27 1/2 inches by 20 1/2, and weighs over 75 lbs. About 1550 calves were required to provide the vellum. The Amiatinus and its lost sisters . . . give some indication of the learning, skill and wealth of Monkwearmouth /Jarrow in the seventh century. Ceolfrith set out on this last journey to Rome in early June of 716, with this five and a half stone Bible, crossing the Channel into Frankia, where monastic Christianity was now flourishing. In the last hundred years two hundred new monasteries had been built. But there was political turmoil. The Merovingian puppet rulers, controlled by the Mayors of the Palace, failed in keeping order. Pepin had been dead for two years, and Charles Martel would not be in charge until he conquered Aquitaine in 719. Ceolfrith died, 25 September 716, at Langres in Burgundy. Various sources tell us that the Pandect was 'lost in France'. Others assert that, after Ceolfrith's burial, some of his followers continued on the pilgrimage, taking the Pandect on to Rome. Why, then, did the Codex Amiatinus languish for a thousand years in a remote abbey of Lombard foundation, on the slopes of Monte Amiata in southern Tuscany? The Abbey of San Salvatore on Monte Amiata was founded, according to documents taken from it, 15 May 742. On that day, they state, Ratchis, King of the Lombards, and former Duke of Friuli, granted land to the Abbot Erfo (also known as Erfone or Corsone), to found a monastery on Monte Amiata. Rathchis, however, actually became King of the Lombards in 744, being crowned as such in Pavia. In the abbey itself the Vision of Ratchis is said to have taken place, 15 May 745. No Northumbrian monks travelling along the Via Francigena's predecessor, the Roman military road into France, could possibly have stayed at the monastery on Monte Amiata in 716-717. It was not yet built. There are thus 26 to 28 years during which 'the movements of the Codex Amiatinus cannot be accounted for'. A further mystery obscures the dedicatory inscription of the Bible. Originally it stated that 'Ceolfridus Anglorum' was giving the Pandect to the Pope, 'corpus' and 'Petris' being mentioned. That original inscription was deleted. The giver was next named as 'Petrus Langobardorum' and the place for which his gift was intended as 'Cenobium Salvatoris'. For a thousand years the Codex Amiatinus was believed to be Italian in origin. It was only at the end of the last century that G.B. Rossi discovered that the original inscription was that of 'Ceolfrith of the English'. Further proof was provided by the Cambridge Professor Mort, who had worked with Bishop Westcott on the attribution of early sources of the Bible. The place in which the Northumbrian Pandect had made its new home was, like Jarrow and Wearmouth, a Benedictine monastery, and a very well-endowed one at the outset, favoured by Carolingian monarchs. Imperial favours were granted to it by Lodovico Pio in 816, which were confirmed and increased by Lothar I in 836, Otto I in 964, Henry II ('the Saint') in 1006, and Konrad II in 1027 and 1036. By then the monastery's jurisdiction extended into northern Lazio, Orvieto, Grosetto and Siena. Perhaps these favours were granted in acknowledgement of Charlemagne's gratitude to the place. In 800 A.D., when on his way to Rome to be crowned Emperor on Christmas Day by Pope Leo II, he was forced to stay for some time at the monastery of San Salvatore on Monte Amiato as the troops accompanying were struck down by plague. Charlemagne and the monks experimented successfully with concoctions made from carline thistles, common on Monte Amiata. The Coronation was able to take place and the monastery had earned the Emperor's gratitude. Until the twelfth century the monastery was an important link in the chain of communications along the pilgrims' route to Rome, the Via Francigena. Pilgrims from all over Europe used this road, and there were inns, hospices, and churches along they way, not to mention bakeries, winesellers and butchers. But as the image of the pilgrim changed, becoming more worldly and 'Chaucerian', so did that of the Benedictine Order. The monks of Amiata sustained military troops, ostensibly to maintain law and order, to protect pilgrims from marauding bandits, Saracens, and their neighbouring Aldobrandeschi. In 1228 the monastery changed hands, being taken over by the Cistercian Order. It was to remain in their control for the next six hundred years. In that time little mention was made of the Codex Amiatinus, except at the Counter Reformation. In the 1570s the Chapter General of the Cistercian Order required that the 'Bible of St Gregory the Great' be consigned to them to be used 'in the correcting of printed texts'. But the Abbot, don Galgano di Pietro, a loan man from Monticello, refused to let the local treasure be removed, and he was duly suspended for disobedience. In 1585 Sixtus V became Pope and appointed a commission to revise the text of the Bible, as a by-product of the Council of Trent. In 1587 he decreed that the Codex Amiatinus be sent to Rome. The Amiatine monks capitulated and allowed their most prized possession out of their hands. Sixtus was associated with Siena, which may account for the decision. On 27 August 1590, Sixtus V died. Immediately, 5 September, the sale of the Bible was prohibited and the Codex Amiatinus returned to the monastery of Monte Amiato, in the care of one of their own monks, who in turn became abbot, Marcello Vanni. In 1780 the Grand Duke Pietro Leopaldo of Tuscany wrote a decree suppressing the Tuscan monasteries. However, having heard of the fame of this monastery, the Grand Duke expressed a desire to see the place. He was feted at the Abbadia S. Salvatore in full pomp by the townsfolk and the monks. But immediately upon leaving he nevertheless signed the document for the monastery's closure. The abbey's vast library and works of art were carted to Florence. Along with the other books, Ceolfrith's great Pandect was taken, first to the Palazzo Vecchio, then, a few years later, to the Biblioteca Laurenziana. It has remained in the Medici Library, designed by Michelangelo, for two hundred years. In that time there have been the Rise and Fall of Napoleon, and the Three Rs, of Romanticism, the Risorgimento and the Restorers. For a brief while Florence was the capital city of united Italy, before that honour passed to Rome. In our own century there have been two World Wars and the Flood of 4 November 1966. During the Second World War the Codex Amiatinus was removed from Florence to a secret hiding place in the Chianti. The church of San Lorenzo, beside the cloister Library, suffered 'damage to roof and windows by shellfire (seven direct hits); 150 square metres of roof reset and 35 square metres of roof to repair'. In 1966 it was once again blessed. The Biblioteca Nazionale had one million, three hundred thousand damaged items and the State Archives had ten per cent of its contents damaged. But the Laurentian Library was safely shelved above the waters lapping around the market square of San Lorenzo. This is the brief history of the almost 1,300 year pilgrimage of the Codex Amiatinus. But why is it of interest to this writer, a non-academic artist/teacher/Jill-of-all-trades? I, like the Codex Amiatinus, was born in Northumbria but with Italian ancestry. One of my earliest exhibitions was held in the Bede Monastery Museum in Jarrow. I left England and lived for many years to the south of Siena, where Monte Amiata is visible on clear days. And recently I, too, have taken up residence in Florence. The Codex Amiatinus was produced by ordinary Northumbrians in their Golden Age. Should not we Northumbrians be working towards a new Golden Age as well as taking pride in what is ours of the past? A half-size facsimile made in Florence of the Codex Amiatinus is available from La Meta Editore. Further essays on the Codex Amiatinus are published at http://www.florin.ms/aleph.html, etc.